We are all concerned about what is happening in Nepal since the Earthquake on 25 April. The losses are devastating, and the news comes in waves. 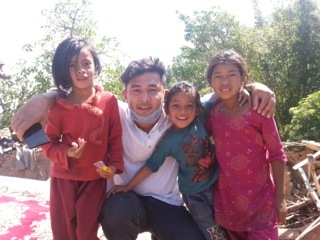 Om Krishna Shrestha, Secretary General and Founder Member of the Social Workers’ Association Nepal has been sending email updates on the disaster and relief activities. Om is a groupwork colleague who attended our Special Interest Group on Group Work this past July in Melbourne, Australia. The following is a copy our correspondence, beginning with the most recent. We will continue to update this page with posts as they come in, including ways to connect and assist. Pictures: 1. meeting with CPSSC 2. meeting with CWISH 3. Earthquake survivors from Kumari Gram-cha receiving tents 4. CWISH Program Manager Saroj K.C. receiving tents as coordinated support from SWAN to establish Child Friendly Learning Centers 5. Meeting with Ward Office Secretary and staff 6. 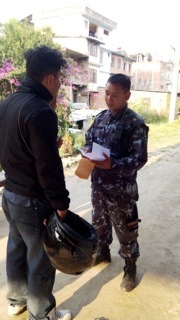 Interaction and dropping letter to primary school teacher at Kumari Gram-cha 7. Informing area police about our presence and coordination for support 8. Children from Kumari Gram-cha “These wonderful smiles are our strengths and inspiration to cope and withstand the adversity, they are our hope of tomorrow and sign of resiliency in the aftermath- Earthquake Twenty Seventy-two” 9. One of the many houses destroyed in April 25, 2015 10. Kumari Gram-cha children living in tent. Many thanks for your kind words and sharing our experience. At the moment we don’t know many organizations, we are very small and trying our best to institutionalize social work in Nepal. However, being a member of ifsw we only know Dr. Rory Truell who is very kind to us and supporting us in this critical situation. We recently corresponded with Social Workers’ council of Hong Kong who assured us to support for relief program. Dr. Carol, just to inform you, as a social worker and representative of Social Workers’ Association Nepal, we are thinking beyond the first aid relief and planning to support with all our effort in rebuilding the community. In this regard, we express our gratitude to Global Group Work for sharing our experience and, please support us with you experience to rebuild the community, we are always ready to learn from within and around the world. 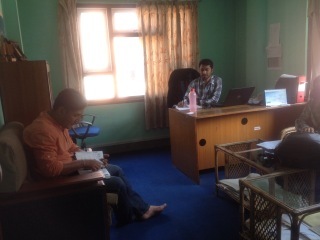 (The individual names are used with permission) Yesterday, (May 05, 2015) we had a planning meeting with Dr. Shishir Subba and Krishna Prashad Bhandari in CPSSC (Counseling Psychology and Social Studies College) Buddhanagar, Kathmandu. The meeting ended up with a strategy to mobilize trained psychologists in Kumari Gram-cha, Baluwa-8, Gokarna. The community Kumari Gram-cha is preferred on the recommendation of local DPRC (Disaster Preparedness and Response Committee) and Ward Citizen’s Forum. 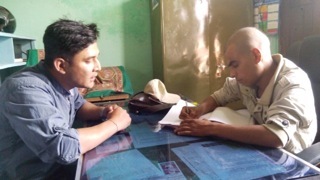 In our interaction with Mr. Naryan Shrestha, a representative from DPRC sub-committee for Kumari Gram-cha, reported of about 105 children, 20 and more elderly citizens and adults who survived the earthquake twenty seventy-two. With reference to the survivors’ number, the meeting has thus decided to set up an assessment and delivering Psychological First Aid to distressed. However, for a long-term approach, Teachers and mothers group is decided to oriented with techniques of PFA both for self-care and children in particular, as they spent most of their time in school and/or home. The orientation classes will be provided to the community participants as a part of awareness and self care program. Our volunteers are extensively been involved in relief distribution and support. They might experience of being affected by what they are seeing and dealing at field every day. Therefore the meeting also decided to provide a session to our volunteers about self-care and counseling, if needed. On the second half of the day, meeting with CWISH (Children Women in Social Service and Human Rights- Non Government Organization) was held on to establish Child Friendly Learning Center at Baluwa and to source material assistance for the center. The program manager Mr. Saroj K.C. agreed on to support establishing the center and providing resource materials. Today (May 06, 2015), meeting with the team of civil engineers decided to do a preliminary inspection of the site. The inspection will be carried out to trace the possibilities to build temporary houses utilizing local resources and remaining of the damaged/destroyed houses, if reusable. On the second half, we went back to the community to coordinate with the government institution at local level for our program. Official letters were dropped at ward office, area police and schools to inform our presence and work at community. The Government institutions responded well and assured with providing required support to the intervention. Coordination with Government institutions and local stakeholders’ like Ward office/VDC, area police, DPRC, Ward citizen’s forum is must to avoid duplication, overlapping of the support and to settle any challenges during the intervention. For more I keep writing you the updates. A copy of this report is sent to the ifsw. Please feel free to make necessary changes, if required. Here are some pics of our planning meeting and Rapid Need Assessment (RNA) at field. With this mail we are also sending you some pictures of our interaction with local relief distribution committee and doing RNA at Baluwa, Gokarna. Through RNA and observation, in most cases we found demand for tent. It is obvious that, as the raining season is closing, most of the earthquake survivors (especially who lost their beloved, family members and house) demanded support for shelter.They have lost their houses and it is not possible to built them back within few months. Particularly, because most of these people are relatively poor in the community. They ever lived in mud and raw brick houses and food has always been their first priority. They own no lands and work for others can only afford them meal for a day. However, we’ve been coordinating with a team of structure engineers to support them with techniques to build temporary house at the moment and we are also planning to training them with earthquake friendly and withstanding houses. The good thing about the support is they themselves are involved in building houses. 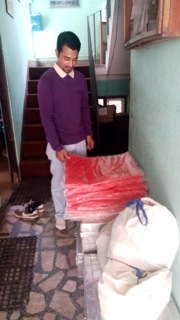 Yesterday, we mobilized our team to dispatch 20 tents for Nuwakot, 33 tents to Dhading and 25 distributed in Kumari Gram-cha, a locality at Baluwa, Gokarna. Updates from other locations are yet to come as our coordinated teams are in field. Please find the RNA form and support provided so far in the attachments. For more, we keep writing you our updates. For your update, we are coordinating with institutional and individual partners to dispatch the first aid support and carrying out Rapid Needs Assessment at the same time. Today a team of our members visited the disaster zone named Sindhupalchwok with first aid support and carried out rapid assessment there. It reported ninety percent of the houses are destroyed, 875 plus deaths and more than 279 injured. The initial sign of potential threat of diarrhea, fever and malaria are seen due to unhygienic sanitation, frequent rainfall and unorganized settlements. The potential exposure of decayed bodies particularly of animals can boost the threat as, much of the focuses are given only to the human bodies at present. Similarly, our another team went to the Bhaktapur ward number 7 and the observed conditions are much similar. Except the threat of wrath and seize while distributing supports. 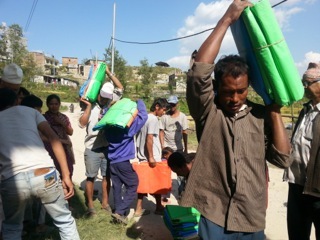 Support distribution at Bhaktapur was much easier than Sindhupalchowk, as it is one of the development centers that is closer to Kathmandu district and connected with accessible roads to source the relief supplies. 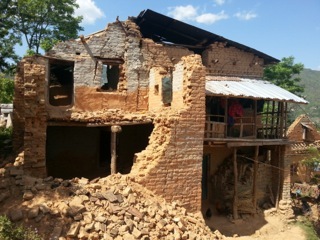 Whilst, in Sindhupalchwok, the damaged property is high in ratio, number of deaths is still increasing and, because of the search and rescue operation government has not been able to dispatch the relief supplies in adequate amount, yet. 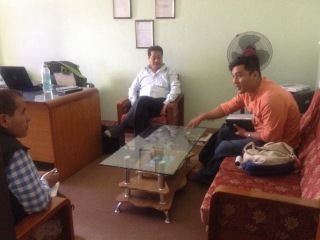 However, we are coordinating with District Administration Office, Police force and Red Cross unit at Sindhupalchwok. A team of social work students from St. Xavier’s College will be mobilized there soon, also individual and institutional supports (first aid, safety and basic needs) will be sourced in and out of the country. Tomorrow we are sending a coordinated team of 12 members to Sindhupalchwok with sizable amount of relief supplies for distribution. However, another team of coordinated support group is heading toward Nuwakot, as well. Yes Om, the news becomes more dreadful by the day. Thank you for taking the time to email me. Please accept my sincere condolences. Our thoughts are with you,your family, colleagues and all those affected. Would it be okay to post your reply on the Global Group Work Website: www.globalgroupworkproject.com, as well on the International Association for Social Work with Groups site: www.iaswg.org ? Please let me know if there are ways to assist your organizations (Social Workers’ Association Nepal, School of Social Work or others) in this effort, and I will post that as well. Thank you Carol, its true that we experienced and witnessed one of the biggest earthquakes in the history of Nepal. You must be listening news of more than four thousand death, wounded, set apart from family members and lost of every thing. Its a moment of great grief and we pray for all those who lost their beloved and family members. However, we are trying our best to source our earnest support to causalities. RIP to all those who lost their life in this earthquake. I have been thinking about you, your colleagues and the many people you work with and connect in Nepal. It seems like such a long time since we met in Melbourne this past summer at the Special Interest Group on Groupwork. The news reports are heartbreaking and I know there are many needs to be addressed. I wonder how we might be of any help across this long distance. Please reach out if you are able.